Here is the longer version of how I managed to misplace Sandy and Marsha's treasured photos for nine months. I am so sorry it happened, but am happy now that I have recovered and returned them. Last October, I made a trip that combined a Twyla college visit and family history tour in New York with a Festival Preview business trip to Nashville. I had a lot going on. Also I was carry two pieces of luggage that I had kept from Helga's estate. It was the first and only time I had used one of those bags. The family part of the trip was tremendously successful. Joanne, Walter and I were together for a visit to Mount Hermon Cemetery, where Walter and Selma Ruby are buried. Then we met with Sandy and Marsha to share our slide show and videos. Later, with Twyla along, too, we all visited the old Ruby home on Walnut Avenue in Long Beach. Truly a day to remember. When we were at Sandy's that day, she and Marsha also shared some of their photo albums. We all agreed it would be great if I would be able to scan some of their photos to include in our digital project. So they each took out photos--about a dozen in all--for me to take home for scanning, after which I would of course return them. One of the photos was a larger portrait mounted in a portfolio envelope. I put the other photos inside the portfolio, and slipped that in the outer pocket of my old leather briefcase/computer bag. I say 'old,' because a few days later, in Nashville, I acquired a new computer bag at the IBMA convention. This is significant because later on, when looking for the picture, I had expected it to still be in that outer pocket in the old briefcase. The briefcase upgrade is what I remembered more than the Helga luggage. I stayed in Nashville for a full week, staying at a Drury Inn a few miles out of town. Since I would be staying so long, I fully unpacked my suitcases, using the dresser drawers, desk and bedside table to organize my belongings. At that time, I obviously transferred the photo portfolio to a location for safe storage. One thing I worried about was, could I have placed it in a desk drawer and later forgotten to take it? I didn't think that was likely, but it was the worst-case scenario. What I in fact did was place it in an inside zippered compartment in the unfamiliar suitcase. I then proceeded to forget all about it. I had a very eventful week participating in the bluegrass convention and talking up Festival Preview to everyone I met. I went into a completely different mode and Ruby family history went out of my mind. When I finally returned home after the long trip, I had accumulated a great deal of literature for the convention and I laid out all these papers on my living room coffee table. Later on, when I began searching for the photos, my assumption was that they would have been among all those papers on the coffee table. Instead they were still in the inside pocket in that now-unpacked and forgotten suitcase in the basement. A few months went by before Marsha sent me email asking about the photos. Oh my god, I realized I had completely forgotten about them. Strangely I couldn't remember ever having seen them since she handed them to me in Massapequa. It was the day before we were leaving for our family trip to Hawaii, and I assured Marsha I would find them when we got back in January. Since then I made what I thought were comprehensive searches. They were in none of my home-office storage systems. I checked and rechecked both the old and new briefcase. I checked the luggage that I would usually carry on a trip like this. For some reason, I didn't check the new suitcase. Before leaving on the most recent trip, I made a further effort by going through some of the remaining boxes of mom and dad's belongings that are in the basement. I didn't really expect to find them there and I didn't. I went off with no resolution to the problem. Of course, I should have been in touch with Sandy and Marsha about the situation, but instead I had let it fester. Now Walter needed to contact Sandy to get information for our visit to Albany. By the time he spoke to her, we were already in the second cemetery, where Sandy's parents are buried, and she was so upset about the photos that she didn't want to talk to me. As I sat on a curb in the cemetery as Walter spoke to Sandy on the cell phone, I once again rethought my movements in the Nashville hotel room from nine months earlier. Suddenly the memory of the other suitcases emerged. I remembered there was a zippered compartment. I wouldn't be able to confirm it until I got home five days later, but now I had hope. Sure enough, when I got back to town on Sunday, I went to the luggage area in the basement and there was that three-piece set of bags sitting in the back. I went to the medium one first, opened the compartment, and there was the portfolio. What a relief. Now that they are recovered, I feel like a dope not for losing them but for not finding them sooner. Maybe I can make up for it by continuing work on the family project, including posting this note here. Here's another great photo from the Sandy collection, or else it is Marsha's. The photo print this was scanned from says October 1957. 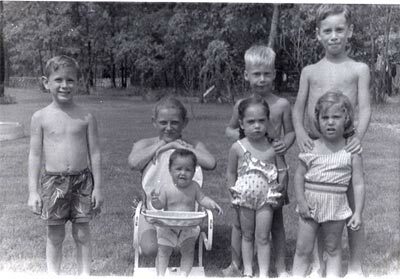 That's Walter, Danny, and Joanne on the right, Robert Felenstein at left, Marsha Felenstein kneeling, and I am guessing Janis and Amy Brenner up front. Stan and Helga's first grandchild turned 21 a few days ago. 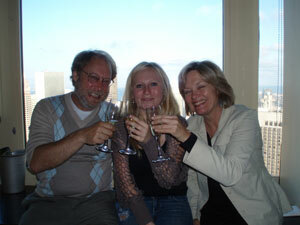 Here's a photo of Twyla, her mom Kate, and her dad Dan enjoying a toast and the view from San Francisco's Top of the Mark. So it was an amazing day and then an email arrives in my inbox from my long-lost childhood buddy Derek Jeffers. Now, I have been Googling Derek on and off for 15 years, or I should say I was Alta Vista-ing or Lycos-ing him. Remember those search engines from the pre-Google days? Derek left very few tracks. The best lead I had found was an article about a French auto workers' strike from the early 1980s. That sounded like Derek, who had gone on from our youthful activism to become a committed Socialist. I had thought that since I hadn't found his biline in the Socialist Worker Party newspaper, that maybe he had fallen out with that group and taken another direction. The idea of him as a strike leader in Paris was certainly romantic. If so, surely he was an international provocateur, riding closed trains across the continent. Such had Derek devolved into a mythic idea in my mind that I nearly jumped out of my seat when I saw the message arrive in my inbox. Yes, it turns out he has been living in Paris for 30-plus years and he actually is an auto worker, though he mentioned the Peugeot plant is currently shut down waiting for parts from Portugal. He filled me in about his three children and wife Esther, an economics professor. They are coming next month to San Diego, where Derek's father had owned a condo before recently passing away. Since they are French, they will have six weeks for the vacation, which means there is every likelihood that I will be able to meet up with my old buddy during his sojourn in California. Plus, he mentions that Esther has an upcoming sabbatical in New York, so there will be more meetings after that. Earlier today, I expressed my delight at hearing from him but begged off from a lengthy reply because I was getting ready to take off on a festival trip. Well, neither Twyla or I were ready to leave at a reasonable hour this evening, so we decided to go in the morning instead. Thus, I was able to spend the last few hours updating this blog. Perhaps Derek will check it again before I get back. If so, he can enjoy this post until I have a chance to write to him directly. One last thing and I am off to bed. Unlike Derek, I'm fairly easy to find on the Internet, though you have to avoid the red herrings like the legislator in Fargo and the sportswriter in San Jose. Walter the prolific author is even more discoverable. Now, with this blog, both of us are popping up even more. I find it interesting that this blog lands high up on the first Google results page for searches on terms like "rabbi spektor" and "ruby family." After this item posts and Google spiders have taken note, we'll also show up among the first hits on "Derek Jeffers."